Obesity is the silent killer that is rapidly turning into a giant public health concern in this century. The rate of obesity continues to skyrocket in the US but is also becoming a problem in developing countries. The World Health Organization came to the frightening conclusion that more people die worldwide from being obese than malnourished. It is estimated that there are around 1.6 billion people that struggle with obesity; 2.5 million people succumb to obesity related deaths every year. Obesity leads to heart disease, some strains of cancer, hypertension, and other illnesses. These alarming rates of obesity put a severe strain on our medical system and put a damper on economic production and output. Experts from Columbia University have recently concluded that obesity now puts a heavier burden on the health care system than smoking. What can be done to curb the obesity epidemic? Our diets have a lot to do with the problem and a simple switch to sucralose, a low calorie sweetener, will go a long way in the struggle to overcome obesity. When we speak about obesity, we often think of middle age people who live sedate lives. Obesity is no longer a middle aged problem though – one third of European and American children and adolescents are overweight and obese. We have to rethink our diets, lifestyles and food choices. Sugary soft drinks and high caloric fast food don’t have to be substituted for carrot sticks and water. Sucralose and weight loss can easily complement each other by offering young people healthy and tasty options. Children and adolescents need to lower their caloric threshold. Studies have shown that sucralose can be helpful in this area. A 2007 study in the journal Pediatrics found that by reducing a child’s caloric intake by 100 calories through the use of sucralose and with some daily physical activity, children more easily maintained a lower body mass index. The Journal of Food Science studied people who consumed calorie reduced food and concluded that these people had a better quality diet with the help of sucralose and did not consume as many calories. Losing weight and tackling obesity does not have to involve extreme measures. Small steps are all that is needed in the obesity struggle. Smaller portions, reduced fat, inclusion of sucralose, and added activity can lead to weight loss without the pain of food deprivation. Sucralose is an essential tool in getting people to the place where they can control their calories and turn their diet into a long term lifestyle diet. Sucralose won’t get you to your weight loss goal in and of itself, but coupled with healthy food choices and activities, you will be well on your way. 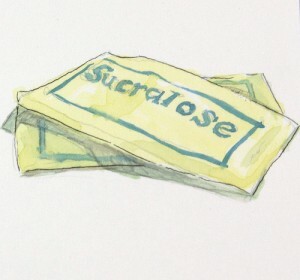 Christopher Gardner, Ph.D., of Stanford University states “…smart use of non-nutritive sweetners could help you reduce added sugars in your diet, therefore lowering the number of calories you eat.” Using sucralose is a simple but smart strategy that will easily lower your daily caloric intake. Why not use sucralose as part of your weight loss plan? Guest author Mike Stromer is a health and fitness writer. He often writes about weight loss and hair loss.